Visitors to the SFC Teaching Garden in 2016 will see some significant changes as we are wrapping up four new grant-funded projects. The Susan Vaughn Foundation awarded SFC with a grant to enhance the Teaching Garden with water conservation methods, a children’s garden, and a production greenhouse. And Whole Kids Foundation awarded SFC with a grant to build an apiary. That’s right, we are getting bees! The Teaching Garden’s two large shade pavilions are where our gardening classes and field trip lectures take place. They are dome-shaped and needed to be retrofitted with gutters so that we could capture rain water to harvest and use in the Teaching Garden and St. David’s Foundation Community Garden. We believe that sustainable gardening in Central Texas should include rain water harvesting to decrease the burden of watering throughout the dry months. Texas Metal Tanks in Dripping Springs, Texas designed and built two 1200 gallon tanks for SFC, and they were installed and began collecting water in November. Now visitors can learn about additional water conservation techniques and hopefully be inspired to incorporate these methods into their home gardens. A production greenhouse for starting seeds and teaching visitors about plant propagation has always been a vision for the Teaching Garden. In just a few weeks, that vision will be a reality when a 360 sq. ft. greenhouse will be constructed in the garden. Using materials and methods suitable to the Central Texas climate, the greenhouse will also be an example of how home owners can build small-scale greenhouses. 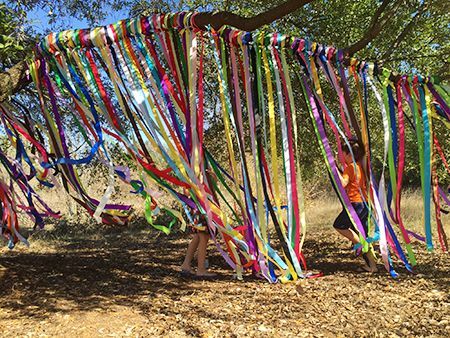 The Teaching Garden has always been a destination for school groups, summer camps and Creative Action’s after school program. In order to offer children a dedicated space for them to explore, a children’s garden was created. The area is easily accessible and designed to include a full sensory experience. There are vegetables and herbs to taste, plants to smell, see, and feel, and coming soon, a soundscape panel to round out the entire experience. 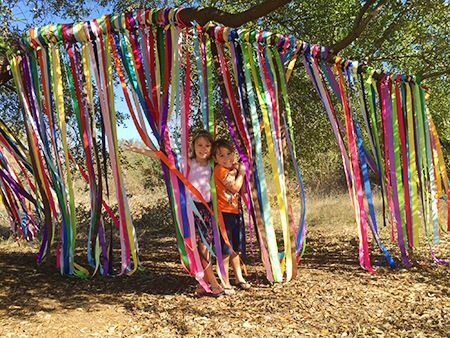 A colorful ribbon tree was created on a neglected oak tree in the garden. We can’t wait to see more children playing in the garden. When the temperatures warm up in Spring, honeybees will be introduced to new hives that will be located in the South part of the garden. The hives will be kept safe by a beautifully designed apiary with educational signage and a viewing area. Look for more children and adult pollinator education programs in 2016 and beyond, as well as a celebratory Bee Week in April.